There can be little doubt that outdoor entertaining is fast becoming the best way to enjoy time with friends and family. It used to be that all entertaining was strictly an indoor activity, normally through the medium of a dinner party, which always felt rather restrictive. Sure there were still good times to be had but there was always a sense of being on ones best behavior. Of course, BBQs have been around for a while and are part of the culture but it seems that recently, thanks to an explosion in choice of outdoor furniture (including the outdoor coffee table about which this piece is going to talk about) we find ourselves in a position where it just makes sense to be enjoying our shindigs in the fresh outside air. Our yards have slowly but surely been molded into ideal spaces to cater for this garden furniture and along with the huge choices available, coupled with the relative ease due to the internet of finding exactly what we desire, we have propelled ourselves into makeshift exterior designers. We no longer have to cast green eyed glances over at the Jones’ from number 47 setup, we can now source our garden furniture sets at the click of a button and at the same time make sure we are getting a good deal to suit any budget. 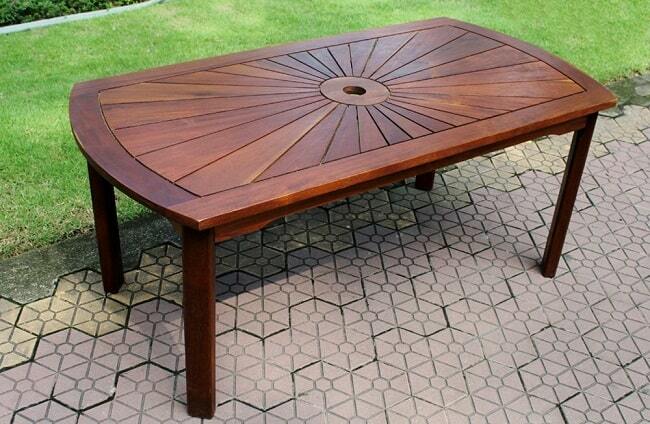 Outdoor coffee tables are an interesting addition to the outdoor furniture set. They are predominantly going to be used for smaller, more intimate gatherings or for you to enjoy your morning paper on your lazy mornings. They certainly can’t be used as a dinner table for larger groups but can definitely take the strain of a few plates here and there if needs be. Ultimately though, the outdoor coffee table should be used as God intended; for coffee mugs, pitchers of iced tea, daily papers and other small items you might need to hand. Below you will find some examples of various outdoor coffee tables that you might consider integrating into your outdoor living space. I will try my best to give you the good and the bad points that each style of table carries with it alongside the best ways to care for it. All tables are highly functional and, as with most things, choosing one that suits your all round needs will be what makes a good, worthwhile purchase into a great one. The comment section can be found below and as always I invite you to add any contributions you may feel we might like to read. It is virtually impossible to leaf through any kind of patio furniture brochure nowadays without clapping your eyes on a piece of rattan. It has invaded the genre wholeheartedly and any modern outdoor coffee table that you may see will probably be made by it. So what is rattan and why has it become so popular? To start with, rattan is found in a couple of different variations; natural and synthetic. Natural rattan is similar to bamboo but is not hollow. The rattan fiber is braided together to make solid pieces of furniture. Synthetic rattan is exactly what you would think it to be, namely manufactured material that is made to look like rattan. Stylistically, rattan is very much on point in today’s market. It has a very minimalist look to most of its designs which means it can fit into most surroundings. There are some differences between natural and synthetic rattan that you might want to note if you’re thinking of going down this route. Being a natural material, rattan is susceptible to degradation over time. You can find some great tips to prolong the life of the furniture here. However, as it is natural it makes the furniture not very suitable for extended outdoor use. Although natural rattan is generally solid and can cope with windy conditions, the fibers can soak up moisture easily which can lead to problems whilst exposure to the sun can fade the material. Synthetic rattan is a great, lightweight option that needs virtually zero maintenance as well as being able to stand up to most weather conditions. You may need to bring it inside during windier times and there are times when the threading can become frayed but this is generally caused by general wear and tear. Protect your tables, be it natural or synthetic, with a cover such as this one from Classic Accessories and you will reap the rewards. This coffee table by Panama Jack is a beautiful example of what a natural rattan coffee table could bring to your shindigs. 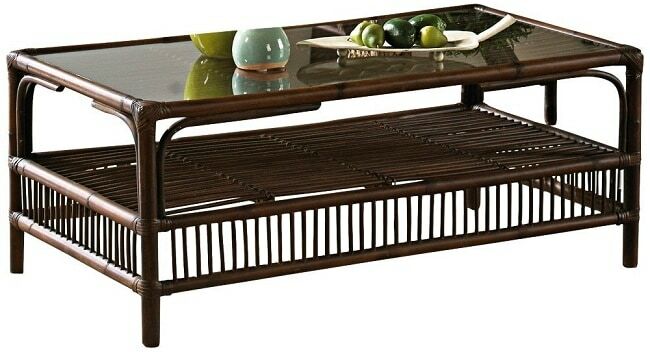 Although not stated as being made for outdoor use I feel it is a great coffee table for occasional use. The styling screams out that it is a quality, solid piece of furniture that is dying to be shown off. It comes complete with a glass top for added stability and shows off a great dark finish. If you are looking for an all year round outdoor coffee table then synthetic rattan is the choice to make. Best Choice Products offer this table as an example which ticks a lot of boxes. It’s lightweight which helps with moving if needs be, it also comes with a glass top to offer a solid footing for your bits and pieces and also offers storage space to keep all your garden knic knacs. Wooden outdoor furniture can be viewed as timeless pieces. They suit every outdoor environment because, ultimately that is where they were sourced and ergo where they belong. Whether it be Acacia, Eucalyptus, Teak, walnut or any number of other wood, there will be a table out there to suit any garden. The benefits of owning wooden garden furniture are that they look good, they’re made from natural sources and they are generally very durable with the right care and attention. Even with general wear and tear, wooden furniture will still stand out from other options as any new scratches or dents or such like will only add character to the piece unlike metal work or rattan which you will just view as damaged. Wood does need to be treated though to make it truly an all weather piece of furniture and so you will need to periodically apply some oil. This pure Tung oil is a great product that works on all types of wood and seals and protects from rain. There are specific oils out there for different woods so you might want to check these out as well but for the convenience of an all-in-one oil, the pure Tung certainly scores highly. As a solid piece of furniture, you’d have to go quite a way to beat this offering from International Caravan for sheer beauty. It’s a stunning piece of Acacia wood fashioned with a sunshine pattern on its surface. It already boasts UV protection due to dual staining which will keep the wood from fading but to be on the safe side I would still treat the table straight away. This will be good practice and will put your mind at ease if there are any doubts that the wood could fade. Teak wood is probably my favorite kind when it comes to outdoor furniture. It can generally be left untreated and will stand up to all weather conditions. This is because there is so much oil that is present in the wood that it naturally weatherproofs it and prevents instances like dry rot. Of course, any added protection is up to you and will not detract from its performance but it is not a necessity. This does make Teak more expensive than other outdoor furniture but given this and the strength that Teak possesses, I see it as a worthy investment. This 42 inch Teak coffee table by Modway is an awesome table that possesses all the above qualities. The round design gives it an eye catching look that can be seen as more child friendly than some of the more angular options available. Outdoor furniture using metalwork comes with a lot of advantages. Firstly they tend to be very solid, heavy items that can be left in even the windiest of days. The designs can be a lot more varied also which lends a touch of individuality to your garden setup. Materials can range from Iron, Bronze, Aluminum and steel to name a few. All are highly weather resistant given the right treatments and can be trusted to last you a very long time. For example, people are often scared off metal as they tend to think it will rust easily. Rust affects Iron, and thus all metals containing Iron, due to oxidation but is easily treated by galvanizing the metal. Using a product similar to this zinc-it spray by CRC will help you with the prevention of oxidation. This cast aluminum table by Darlee is an example of why metal tables are so loved by many. It is an incredibly sturdy table which features some beautiful, intricately designed metal work on its surface. No need to worry about spillages, no need to worry about possibly breaking the glass top (there is none), all you can do is sit back and admire the craftsmanship. Pangea Home and Garden offer this unique looking table. 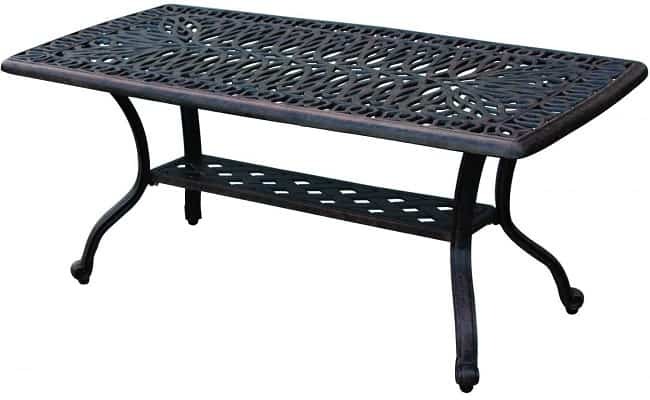 Made from recycled wrought Iron, it possesses a solid table top and comes with a powder coated finish that will give all round protection. It is one single piece, meaning that there are no screws or assembly needed and due to its design it will surely make a great conversation piece. At 20 inches wide this is certainly made to be a side table for your outdoor needs but I think, if bought as a pair, it would certainly bring some great character to your outdoor space.